How to cook pasta, to separate them? Pasta is one of the most popular and easy-to-prepare side dishes. However, in the process of cooking they may stick together. To avoid this, you need to follow certain rules of cooking. Purchase for making high-quality pasta. Products of good quality have a uniform color, slightly shiny, slightly translucent surface. In the package there should be no crumbs and pieces of pasta. Take for cooking a large, deep pan with thick walls. Pour water into it at the rate of 1 liter per 100 grams of pasta: in a large volume of water the pasta will not stick together. Put on fire a pan and wait until the water boils. Salt water and pour it in a little vegetable oil. 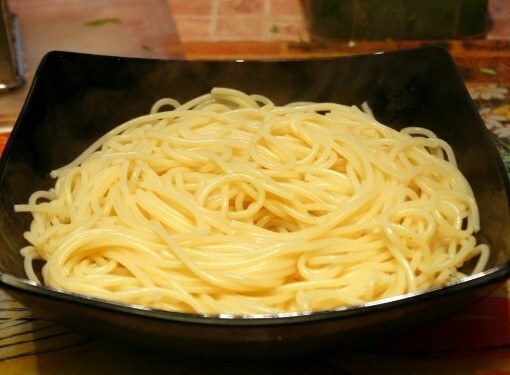 Put the pasta in boiling salted water, and they should be dropped in the center of the pan. Fire take, it is necessary that the boiling process was restored as quickly as possible. After boiling, stir the pasta so that they separated from the vessel walls and from each other. Cook pasta with the lid open, stir them again in a few minutes. Add some salt to them anymore. In the process of cooking, follow the cooking time indicated on the package, but it can vary depending on the amount of pasta and water, the intensity of the flame, the hardness of the water. So they need to try. Some people like pasta cooked in Italian "al dente" (underdone), while others prefer a dish cooked in the traditional way. Do not allow the digestion of the pasta, in this case the dish will turn out sticky. When the pasta is cooked, drain: use a colander or just slightly cover the pan, and pour the liquid. Do not rinse the pasta, they get crumbly. Pour in cooked pasta a little butter or oil and mix well. Give them a few minutes to stand and stir again. 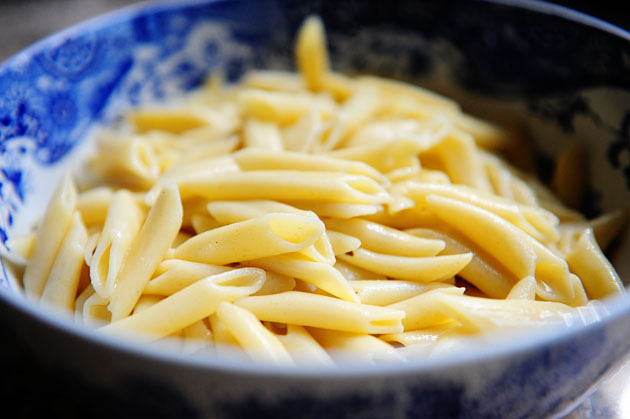 While pasta is cooling, they can be stirred a few times, then they will not stick together. Advice 2 : How to cook pasta, to separate them? Pasta is a favourite side dish for adults and children. But, really tasty there are only those the noodles don't stick together in the cooking process and turned into mush. How to cook them? 1. Water should not be enough. At the rate of about 1 liter of water per 100 grams of pasta. 2. Pasta should only pour in a pot of boiling water. Water with salt before it would be pasta. 3. After the pasta was dumped into a pot of water - mix them well so that the pasta does not stick to the bottom of the pan. You should not cover it with a lid. 4. Once the pasta water is boiling again, again gently stir. 5. The cooking time is usually indicated on the package and depends on the type of pasta. The smaller the pasta, the less time to prepare you need. On average, 5-10 minutes. It is important not to overdo the pasta, so they do not seethe. In the case of pasta it is better not to think than to digest. 6. Cooked pasta, quickly and carefully drain in a colander. Option 1 (classic) rinse the pasta water and stir, gently heat in a pan with a knob of butter. Option 2 (simplified) - pasta drain in a colander, wait until the water drips off again to put the pasta into the pan and add a knob of butter or teaspoon of vegetable oil. Mix gently. Tip: choose a pasta from durum wheat, they are healthy and will not be soft after boiling in the cooking process.